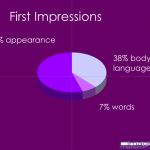 Ever wonder what impression you give at interview? P.C. or no, research shows employers make subconscious judgements based on appearance. How you dress for interview can pre-determine a positive or negative outcome. Look at the frequently asked questions here and see if you can answer them. Then scroll down to reveal colormebeautiful’s essential advice. Bold colours make more impact, right? What about make-up, does it really matter? Are trousers acceptable for an interview? Are soft or button-down collars OK? Do I wear my loudest tie for maximum effect? Can anyone wear a double-breasted jacket? I look too young. How can I look more mature? Dark colours create a more authoritative impression than lighter shades. To look both smart and in-charge, select colours that are not only appropriate for your job but that are also flattering to you. Women who wear makeup get promoted faster and earn more. True? But research shoes that too much makeup is worse than none at all. Therefore wear no more than enough to make you look healthy, natural and polished. More than 15 minutes is overkill. Ask colormebeautiful for expert help on your makeup concerns. Trouser-suits today can be both smart and professional. The key is to be ruthlessly honest with yourself about how you look in them. Check front, side and rear views. If you’re not a success in all three views, choose something else for the interview. The fashion for shirts comes and goes, but if this is a serious business interview, a standard shirt collar is best. It will give you a professional and businesslike look. Button-down collars are generally made in Oxford cloth, which is sofer and more casual-looking. Market research shows that employers are put off by loud personality. Most employers seem to think that high-fashion ties are worn only by such individuals. A tie is the best indicator of a man’s confidence and success. Play it safe – but not too much. Blues are the least offensive, with yellow, green or brown ties losing you points in terms of that first crucial impression. Red ties are seen as aggressive by most employers. If you are thick-waisted, or if you are short, a double-breasted jacket or blazer focuses attention on your least-flattering physical characteristics. To look older and more experienced wear a dark, classic suit, but not a black one. Wear a lighter coloured but not necessarily white shirt. This projects a more mature image than a pastel or striped shirt.